The concept of world water scarcity is hard to imagine. Most developed countries take clean water for granted. In the United States, we turn on the tap and rarely think about our drinking water source, its quality, or its reliability of access. We assume there will always be more drinking water. However, our endless supply of water is drying up and this situation is affecting more people every day. It seems strange to imagine, but water will soon become the most important resource in the world. Even in places where we always expect there to be an abundance of water, such as California, there is a serious shortage developing. Government officials have said that California is experiencing the worst drought in modern history. To combat this threat, they have begun damming local rivers (killing off nearby ecosystems in the process) to maintain the water levels that people are accustomed to. 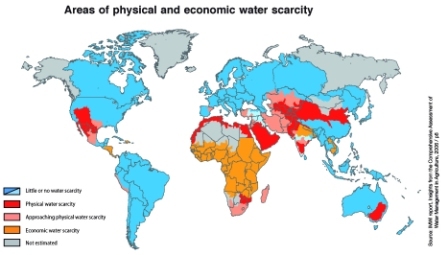 While the developed countries are just beginning to experience water scarcity (known as water stress) developing and third-world countries are in the midst of a serious crisis. Around 1.2 billion people experience physical scarcity, where water is not available due to climates and weather. And another 1.6 billion people experience economic scarcity, where water can be found but it requires more resources to do so. For example, the average woman or child living in rural Sub-Sahara Africa has to walk 6 to 9 miles to provide water for the family. The water that she gets is usually contaminated with deadly diseases such as cholera, typhoid, and dysentery. These diarrheal diseases are responsible for about one-fifth of child deaths in the world, killing six million a year, or over 15,000 a day. These daily searches for water take opportunity from the women and children. The children are taken out of school and the women can’t provide other forms of money-making labor or family support. The Sub-Saharan Africans are estimated to lose 40 billion hours a year in their daily hunt for water. This number is so massive it is hard to imagine. This is how a little help from us can go a long way. Every dollar we donate or every minute we spend increasing awareness about world water scarcity can help a village buy a local water purifier, develop aquifers, or provide necessary sanitation for their people in need. A number of websites are set up to help these people in need, such as wateraid.org, thewaterproject.org, and projecthumanity.org. If interested, check them out to see how you can help. Drinking Water Shortage - When Will We Run Out of Water? What Is the Water Content of Things?